For more than two decades, the attorneys of Kline & Specter PC have employed the latest investigative tools and technology to seek optimal results for our clients. With more than 40 lawyers—five of whom are also medical doctors, the most for any law firm in the United States—our verdicts and settlements in medical malpractice cases prove our track record of exceptional results in Philadelphia, Pennsylvania, New Jersey, Delaware and across the United States. 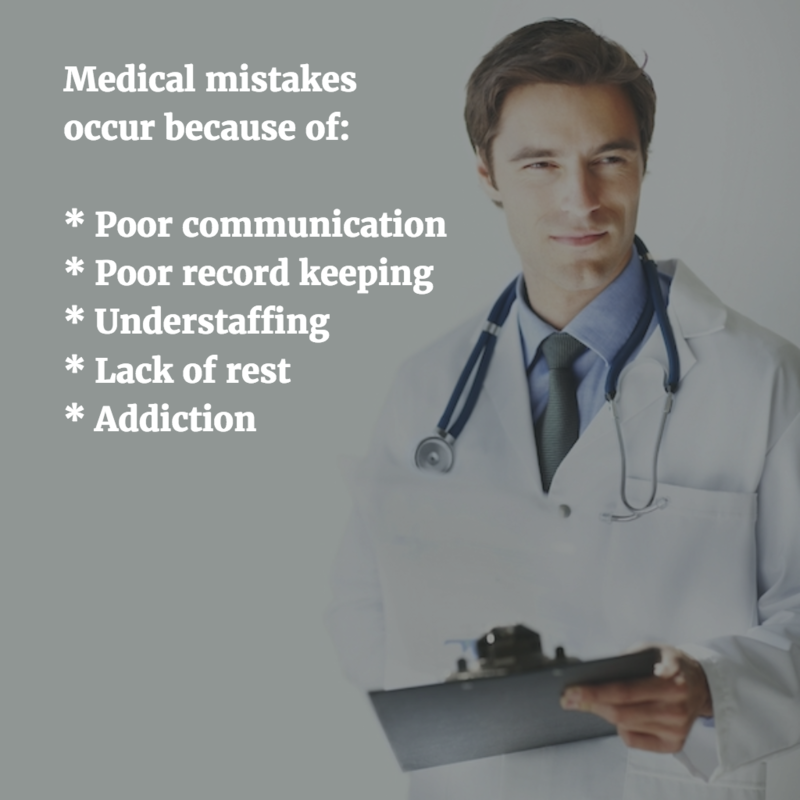 Why Do Medical Mistakes Occur? 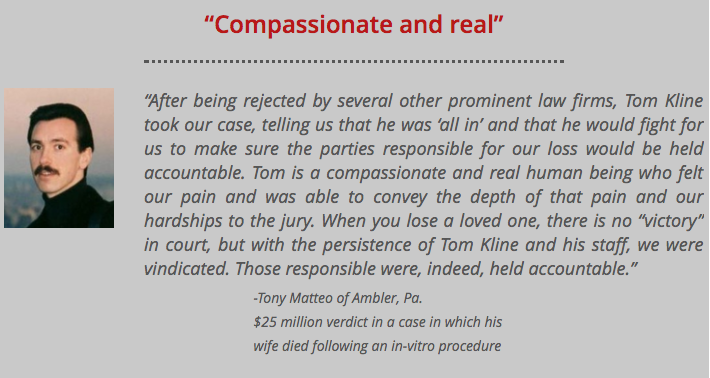 A Philadelphia Common Pleas jury awarded the largest-ever medical malpractice verdict in Pennsylvania. Awarded for a baby who suffered severe brain damage and the amputation of an arm due to medical malpractice by a surgeon and other doctors and staff who were responsible for the infant’s care. Our attorneys won this verdict in the Allegheny County case of a midwife whose actions caused infant oxygen deprivation, which resulted in cerebral palsy. We secured this verdict in the case of a Philadelphia hospital error that left a young man severely brain-damaged. This federal court verdict, for an infant who injured in a botched forceps delivery, was believed to be the largest-ever for a medical malpractice case in Pennsylvania’s Middle District. 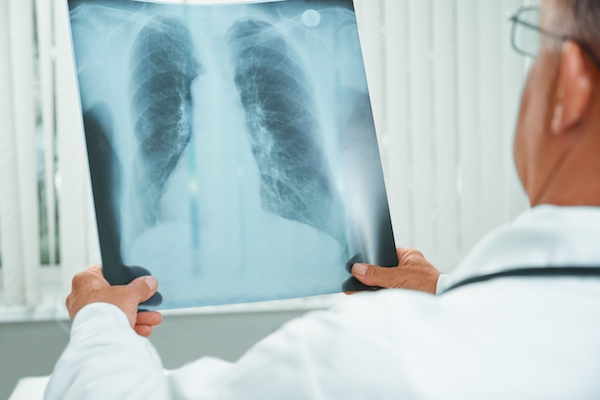 Kline & Specter won this verdict in the lawsuit involving a Lehigh County, Pa., woman whose missed breast cancer diagnosis resulted in her death. 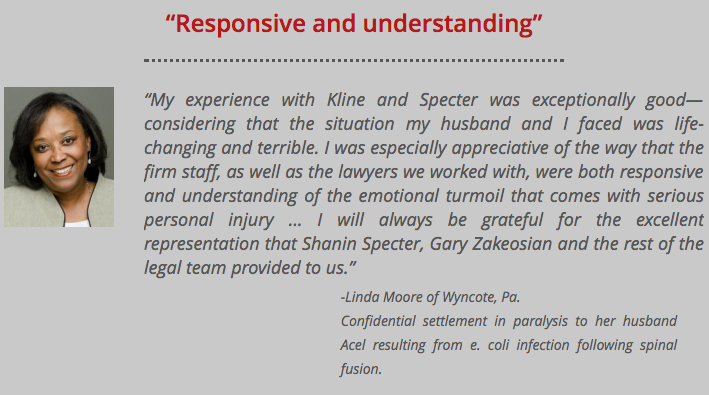 Successes such as these are the reason Kline & Specter is consistently ranked among the best medical malpractice law firms in Philadelphia and across Pennsylvania by U.S. News Media Group’s Best Lawyers listing. Kline & Specter has a seasoned litigation team that includes five full-time physician/lawyers, the most of any law firm in the country. Our attorneys are trial lawyers with decades of legal victories. 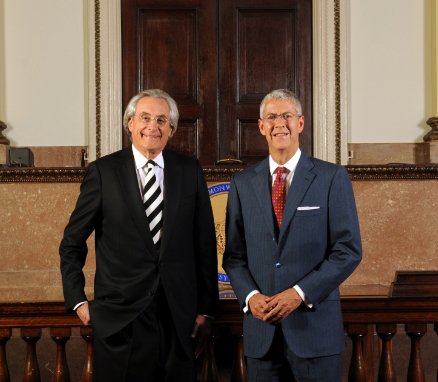 Since the firm’s inception in 1995, our lawyers have had more large recoveries than any other firm in Pennsylvania. Our experienced team of attorneys attended a litany of prestigious colleges and universities, including Harvard, Yale, the University of Pennsylvania (11 total), Princeton, Williams, Haverford, Georgetown, Oxford and Cambridge, among others. When you reach out to us, you gain the peace of mind of knowing that our attorneys are among the best in Pennsylvania and across the country at litigating medical malpractice lawsuits. What are Some Common Medical Malpractice Cases Our Lawyers Handle? Many thousands of Americans die each year as the result of medical errors. According to a comprehensive, highly regarded hospital survey conducted by Harvard University, more than one million people suffer injuries each year as a result of medical mistakes. Many victims don’t realize that their injury was caused by medical error. That’s why it takes a skilled team of lawyers and doctors to investigate the causes of injuries or deaths following medical procedures. We trust doctors and other medical personnel with our lives and the well-being of our loved ones, but that trust can end in tragedy for thousands of patients. Should you or a family member suffer a serious injury or death as the result of a medical error, protect your rights by consulting an experienced medical malpractice lawyer. With about 1,000 medical malpractice lawsuits filed in Pennsylvania and less than 400 medical malpractice lawsuits filed in Philadelphia and only a few dozen jury trials heard each year, few lawyers have the experience necessary to successfully litigate your medical malpractice case. Turn to the nationally recognized lawyers of Kline & Specter to handle your medical malpractice case. Call our law firm today at 800-243-1100 for your free case consultation. We work on a contingent fee basis – which means we only get paid if and when you are financially compensated. In order to successfully pursue a medical malpractice case, you must be able to prove that you suffered injuries because of a medical professional’s negligence. Being dissatisfied with your treatment or the outcome of your surgery is not in itself grounds for a medical malpractice case. We can help you understand your legal rights, who can be held legally responsible for your injuries and whether you should pursue a medical malpractice claim. The harm that you suffered may be in the form of physical injury, financial injury, or non-economic losses. Often all three types of harm are experienced and we must fight to recover the necessary compensation for those injuries. The financial costs of severe injuries can burden you and your family for years to come. Time away from work, medical bills, rehabilitative care, and long-term care can add up to millions of dollars. No family is prepared for those costs. Non-economic losses include those priceless things, such as quality of life and future health and well-being. In a lawsuit for medical malpractice, we can pursue justice for the pain and suffering you and your family have endured. Was a Medical Professional Negligent in Your Care? Delaying or misdiagnosing severe conditions. A delay in diagnosis is often caused by a doctor failing to order the correct tests or misinterpreting the results of those tests. The effect of delayed diagnosis is the worsening of the condition because it is left untreated. In severe cases, such as those involving cancer or meningitis, this can lead to the tragic death of the patient. Incorrectly prescribing or administering medication. From the doctor who prescribes the medication to the pharmacist who fills the order to the nurse or healthcare worker who administers the dose to the patient, these medical professionals are responsible for the proper dosing and administration of prescription drugs. Many drugs can cause dangerous interactions when mixed together, and administering the wrong medication or the wrong amount of medication can put your health at serious risk. All surgical procedures come with some risk. However, surgeons and their staff must act within the generally accepted standard of care for each patient. Surgical mistakes include negligence such as wrong-site surgeries and leaving surgical instruments inside the body. Post-operative mistakes include shortcomings such as failure to notice hemorrhaging or infection and failure to administer necessary recovery medications. Medical equipment should be designed to aid in improving patient health and safety. While some medical devices are defective and pose dangers to patients, others are simply misused by medical personnel and cause more harm to an already ailing patient. Creating unsafe conditions during labor and delivery. Childbirth is simultaneously a routine and a potentially dangerous medical situation. If a doctor or other medical professional fails to recognize signs of stress during delivery or fails to diagnose prenatal conditions, the mother and child may both suffer serious injuries. A study published in the Journal of Patient Safety reported that hospital errors may be responsible for 200,000 to 400,000 deaths annually. Faced with these staggering statistics and the real-life experience of suffering an injury because of medical malpractice, many people question why these medical mistakes happen. Lack of communication between doctors and hospital staff regarding patient care. Poor record keeping that causes doctors to miss important details about a patient’s medical history or medication allergies. Understaffed facilities that encourage overworked staff to cut corners and ignore proper procedures. Lack of rest both for doctors and staff who may be asked to work long hours with little sleep, which can compromise decision-making. Alcohol or drug dependence of doctors and staff. High-stress environments such as hospitals see increased addiction to alcohol and other drugs by employees. Our medical malpractice attorneys handle lawsuits in Philadelphia and throughout Pennsylvania, New Jersey, Delaware and nationwide. During your case consultation, we will answer your questions about pursuing a medical malpractice claim. However, here we address some of the common questions posed by clients and prospective clients to our malpractice lawyers. If you or a loved one suffered serious injury or death resulting from a medical error in Pennsylvania, Delaware, New Jersey, please contact Kline & Specter online today to schedule your free case consultation or call 800-243-1100 to speak with an experienced medical malpractice attorney about your case. Our medical malpractice lawyers handle lawsuits throughout Pennsylvania, New Jersey, and Delaware. Map and directions for our Philadelphia medical malpractice law office.